Something has been happening at the shop on Tuesday Nights over the last few months: raw energy and enthusiasm for anything and everything bikes. What, might you ask, is the source? 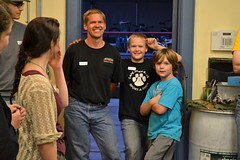 Kevin and two of our youngest volunteers, Nash and Owen! Since early this year, Kevin has been volunteering with us and bringing with him his son Nash and nephew Owen. They join us in our shop regularly to recycle and rebuild bikes to support our community bike programs. Kevin is a long time cyclist and loves supporting our programs that help keep people biking. “We are so lucky to be living here in the Portland area where there is such a huge cycling community, but there are so many kids that still aren’t exposed to cycling as a transportation tool,” he observes. He saw our weekly Drop-In Nights as a fun way to engage Nash and Owen and brought the boys here so they could learn more about bike maintenance. Their energy abounds and as long time volunteer Virginia Quinn puts it,“They are the most of everything: the most energetic, the most young, and the most fun to work with!” We’ve never seen a single person so excited about a used, bent rack, as Nash recently pleaded with Kevin to purchase for his future Seattle to Portland aspirations. Not to be overshadowed, Owen can easily be spotted throwing a damaged steel frame into a recycling bin and pumping his fists in the air afterward. “I’ve learned everything I know about bikes by coming here,” says Owen. We are happy to let their excitement cheer us up every week as we chip away at our goal of refurbishing 400 bikes for our annual Holiday Bike Drive. Thanks for helping us, you three!